Exactly one year ago, I got brave and shared a dream of mine here: I felt ready to write a book. I didn’t have a timeline, nor a story or theme I was desperate to write about. I could just feel the book making its way to me, and I knew giving voice to that dream would pull it closer. And then, quite honestly, I forgot about it. Lots of other things took priority, from work stuff to family stuff, and I put that dream on hold. But the universe didn’t. With a million little twists of fate, it made that dream come true at the speed of light. And now, I am over-the-moon excited to tell you that my soul-sister-friend Lori Portka and I are writing a book together. WHAT!? Many of you know that last fall, our worlds turned upside down and inside out when Spirit – the circle of ascended wise ones on the Other Side whom I work with during my intuitive readings – swooped in and teamed us up. Lori had just texted me, feeling deflated because a publisher she was working with on a big project had just rejected eight of her paintings. As soon as I saw her text, it felt like a lightning bolt jolted through me and I heard the voice of Spirit saying those paintings were for us, for a new project called Infinite Purpose. They provided detailed instructions for leading an eight-week online program featuring Lori’s artwork and Spirit’s words (transcribed by me). To be honest, we both thought it sounded kinda crazy. But it also felt so big and powerful, we couldn’t say no. Lori and I were shocked when 250 people signed up, fast as lightning, eager to step deeper into their callings. 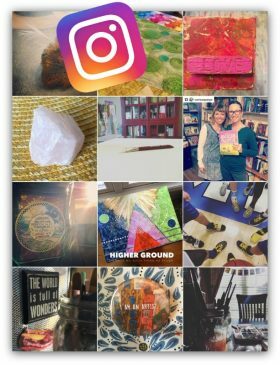 And as we sent out a new message from Spirit and the corresponding painting to participants each week, we were blown away by the magic that transpired in their lives and ours. Not long after that program ended, Spirit appeared again with a new vision. Those teachings were to become a book, they said – with personal stories, room for reflection and more gorgeous art. All of the pieces fell into place within days and we found ourselves giddy with excitement, toasting over Skype, as we signed contracts to birth this book into the world. We have spent the last couple of months totally immersed in making INFINITE PURPOSE: Care Instructions for Your True Calling a total treasure for you – a gorgeous, full-color, hardcover gift book/guide book/journal/life changer. Because it will be so different than anything on the market, and because we know it’s meant to be birthed into the world lickety-split, we’re self-publishing this book with the awesome blossoms at Wise Ink. They are total pros and they’re keeping us on our toes in order to release this book on 11/11/15. Holy wow. There’s a lot more work to do. And we’ll need your help along the way. So, we’ll be sharing fun behind-the-scenes magic, plus inspiration from the book on our brand new Facebook page (Facebook.com/InfinitePurpose). We’d be so grateful if you’d “like” the page and become part of this wild and wonderful journey with us!